Melt-Away Foam Ceiling Tiles are specially made to melt out of a suspended ceiling grid system and approved for installation below automatic sprinkler systems. Melt-Away Ceiling Tiles are easy to install, simply lay in grid or drop in grid, trim with a sharp knife, clean with soap & water. 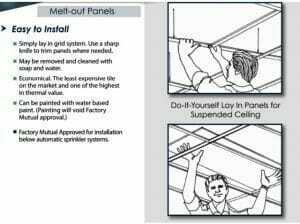 Melt-Away Foam Ceiling Tiles are specially made to melt out of a suspended ceiling grid system. MELT AWAY-TILE is Factory Mutual approved for installation below an automatic sprinkler system. Just lay the 2 x 4-foot or 2 x 2 panel in the grid*. The tiles may be removed and cleaned with mild soap and water. They can be painted with a water based paint, but doing so will void the Factory Mutual approval. MELT AWAY TILES are available in 1 inch thickness and 2 feet x 4’ feet and Sold by Cartons only, Minimum Order 2 cartons. Twelve (12) Tiles per carton covering 96 square feet per carton. Long term service temperature of Melt Away TILE is 167° F. Care should be taken not to use this melt-away ceiling tile near heater vents, steam pipes, chimneys, or any other surface that has the potential of reaching 150° F or more. 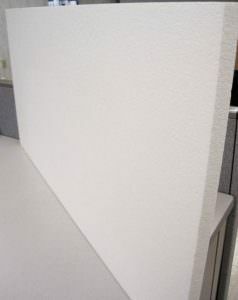 Melt Away Tile is manufactured from modified beads, Expanded Polystyrene (EPS) Board and should be considered combustible. Melt Away Tiles have a R 3.8 Rating, R-Value is the capacity of an insulating material to resist heat flow. Value for 1″ Thickness R – 3.85. The higher the R-value, the greater the insulating power. Large Orders of 24” x 48” x 1” is packaged 35 pieces per stretch-wrapped bundle or large for pallet shipment.